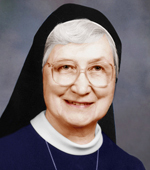 Sister Marian Teresa Brophy, I.H.M. Sister Marian Teresa Brophy, I.H.M. (formerly Sister Joseph William), died Oct. 3 in Camilla Hall, Immaculata, in the 73rd year of her religious life. She was 93 years old. Born in Philadelphia, she entered the Congregation of the Sisters, Servants of the Immaculate Heart of Mary in 1944 from Most Blessed Sacrament Parish and professed her vows in 1947. Sister Marian Teresa taught in the elementary and secondary schools in the Archdiocese of Philadelphia, taught religion and English in Chile and Peru and served as a director of religious education in the Diocese of Camden, N.J. She also served as principal in parish schools in the dioceses of Allentown and Raleigh, N.C. Her last assignment before the Apostolate of Prayer at Camilla Hall Nursing Home was in the IHM Literacy Center in Philadelphia where she served for five years. The funeral Mass was celebrated at Camilla Hall on Monday, Oct. 9. The celebrant and homilist was Father William Dean. Also concelebrating was Msgr. Joseph Logrip. In addition to her congregation of I.H.M. sisters, she is survived by her sister, Veronica McDonald, her sister-in-law Ann (Robert) Brophy, many loving nieces and nephews, grandnieces and grandnephews. Sister Marian Teresa was predeceased by her parents, William and Marian Sheridan Brophy; her brothers, William, Robert and Joseph; her sisters, Anna Marie (Joseph) Yanak, Rosemary (Joseph) Bradley; and her brother-in-law, James McDonald.